Janet Grace Riehl is an award-winning author, artist, and performer. Her first book, Sightlines: A Poet’s Diary, is now available as an audiobook, Sightlines: A Family Love Story in Poetry and Music. 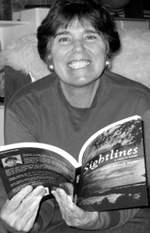 Janet’s poems, stories, and essays have been published in national literary magazines and anthologies. She is a member of the Authors Guild and is registered with Poets and Writers. From St. Louis, Janet frequently crosses the Mississippi to partner with her ninety-four-year-old father on musical and literary projects. Her blog-magazine, Riehl Life: Village Wisdom for the 21st Century, is dedicated to creating connections through the arts and across cultures.